2006 was seen out and 2007 in by movies - and Hrithik was wiggling as midnight turned - but somewhere in all the madness I lost my voice (figuratively). I can't think of a single thing worth sharing about either Main Khiladi Tu Anari or Chori Chori except that the cover of the latter has some hilarious verbiage about how love "makes the mornings glow, the days flow, and puts a smile on evening" and that it "sneaks up on us like the wind in the woods and washes us with its freshness," none of which has particular significance to the movie. Also Ajay Devgan sports some very fitted shirts in it, making him look a little like a cop going undercover as a Bollywood star, although as Abby and I agreed, "tight shirts are his color." 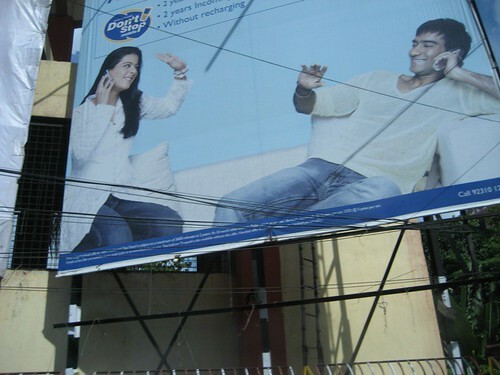 I like Ajay Devgan but now whenever I see him I think of cell phones, thanks to a relentless billboard campaign that followed me around India last summer. But the thought of leaving readers without a "hmmm" or a giggle makes me really sad - and is soooo not 2007 - so please go read Susania's post on Bollywood Fugly about Main Khiladi Tu Anari, which is not to be missed. Happy New Year 2007! Hope to see lots of posts/reviews on this blog this year! Happy New Year! Is it too passe to do best/worst/fugliest film of 2006?